I believe I said something like that I probably wasn't going to review all the new class missions individually, but now that I've completed the four Republic ones at least, I really kind of want to get my thoughts on them off my chest. Spoilers abound, so beware if you haven't played through any of these stories yet. With my Commando being my main, this was the first of the new class stories that I completed. It was nice to see General Garza again, though also somewhat surprising to see someone of her rank come to Rishi personally. I was also surprised by how she treated my character almost as an equal - it's been a long time since I played through the original trooper story, but I don't remember getting promoted to quite that high a level at the end. You can even tell her off for her attitude and threaten to expose her mistakes to the public. The story of Eclipse Squad is a bit of a throwback to the trooper's Chapter One, what with the whole "hunting down a rogue squad" theme, even if their background is different. I liked that, though I felt that this story more than any of the others I've seen so far really would have benefited from being longer. Garza sums up every Eclipse Squad member's background in a brief voice-over as you kill them, and I couldn't help but think that there was a lot of unrealised potential there. I really would have liked it if there had been some time to flesh those characters out some more. Considering the overall tack of the Jedi knight story, which is all about being a big damn hero with your lightsaber, it was quite surprising that the knight's newest class mission turned out to be very quiet and introspective. It doesn't even require you to kill anything, though a couple of cove crabs might potentially get in your way at one of the monsoon baffles. I had somewhat mixed feelings about this. On the one hand it was nice to be reminded of a side of the Jedi that doesn't really get much attention in the original Jedi knight story, but on the other hand it does feel a bit odd to go off to cure the sick and clean up the local town when you're supposed to be stopping Revan. You can bring this up in conversation with Master Orgus' spirit, but your concerns get brushed off in a manner that I didn't find entirely convincing. Still, overall I really enjoyed this story, so I guess the positives won out. 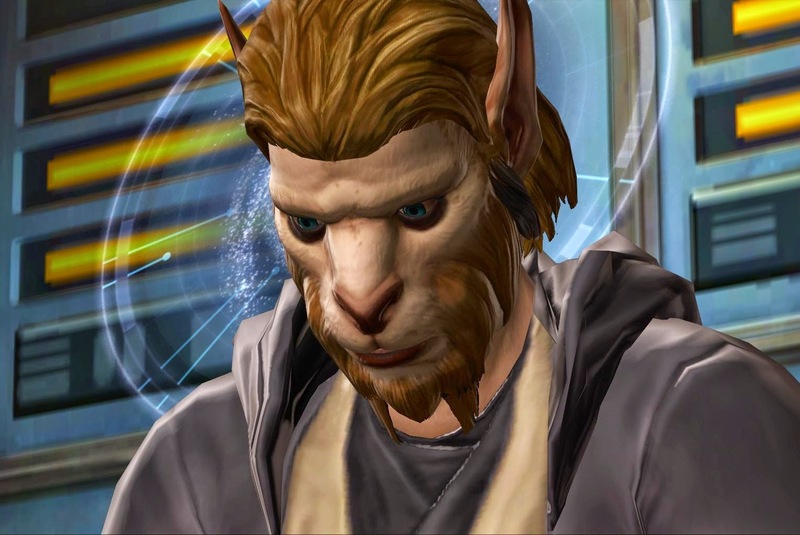 The Jedi consular's new class mission is also quiet and introspective, though in this case that's completely in line with the previous class story. It's nice to be called by Master Satele and to be reminded that your character is supposed to be kind of a "big deal", something that you may have forgotten if it's been a long time since you actually completed the original class story and have been spending your time doing dailies and running flashpoints since then (like me). It's also worth noting that while Master Satele gives you a brief call, the consular story is one that doesn't so much rely on bringing back an old character but instead introduces a new one: Master O'a the Bothan. Just seeing another Bothan in game is cool, but Master O'a also has an interesting personality, and his visions of the future provide fascinating insights into your own character. This class mission may very well be one of my favourites. The smuggler story was sadly a bit of a disappointment, in more than one respect. It brings back Beryl Thorne, a character from your past, but she's such a comparatively minor character that this doesn't have as much of an effect as the throwbacks that happen in other class stories. She only features on Taris and then briefly on Quesh. Male smugglers can romance her and maybe having done so makes her story more compelling, but personally I struggled to remember much about her. In fact, my character seemed to recall more than I did, and asked Beryl where she left her droid... while I couldn't even remember that she had one. The other problem was simply that the "action" was woefully short. None of the class stories on Rishi are very long, but I recorded all of the ones that I played through so far and this one was actually several minutes shorter than all the others. You just click on three things and then kill a single mob... it simply felt disappointing and like there really should have been more to it.